Schwartz & Wade, 9780385386111, 40pp. H, Little O, and Baby Em are stuck in the city for the summer with only their pet goldfish—Barracuda, Patch, and Fiss—for company. It's looking like it might be a pretty boring vacation, but one day, something exciting happens. Someone starts fixing up the old fountain down the street—the one Grandpa says horses used to drink from before everyone had cars—and a sign appears: "Calling All Goldfish Looking for a Summer Home." 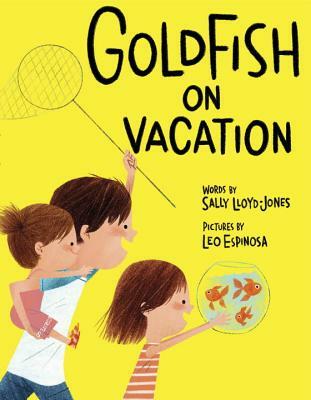 H, Little O, and Baby Em can't wait to send their goldfish on vacation, and the fish, well, they seem pretty excited too. Based on the true story of Hamilton Fountain in New York City, this charming tale of one special summer will delight readers young and old. Author’s Note included. Sally Lloyd-Jones is the author of the New York Times bestseller How to Be a Baby . . . by Me, the Big Sister and its companions, How to Get Married . . . by Me, the Bride and How to Get a Job . . . by Me, the Boss. She has written many other books for children, including Poor Doreen and The House That's Your Home. She spent her childhood in Africa and England and now lives in New York City. Visit her at sallylloyd-jones.com, or on Twitter @sallylloydjones. Leo Espinosa received the Founder's Award from the Society of Illustrators for Jackrabbit McCabe and the Electric Telegraph, which was also a Bank Street College of Education Best Book of the Year. His illustrations have graced the pages of the New Yorker, Wired, Esquire, and the New York Times, among many other publications. He is also a commercial artist whose work can be seen on toys, games, stationery, and clothing. Originally from Bogotá, Colombia, he lives with his family in Salt Lake City. Learn more at studioespinosa.com.